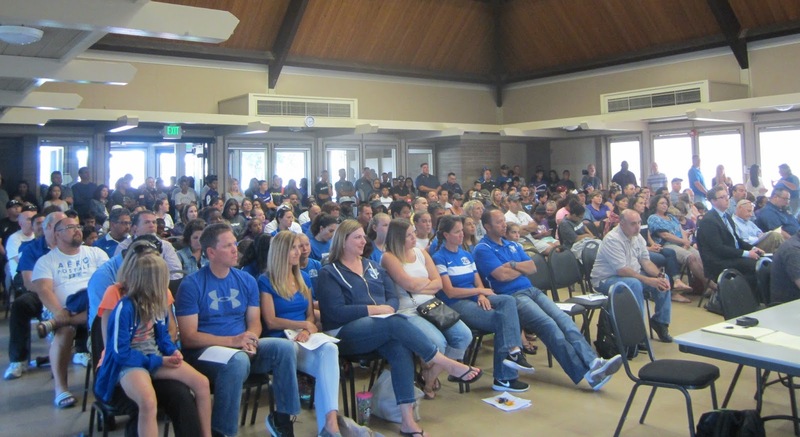 Before a standing room audience at a special meeting held last night, the Cosumnes Community Services District (CCSD) Board of Directors expressed willingness to change the process for allocation of athletic fields youth leagues in Elk Grove. 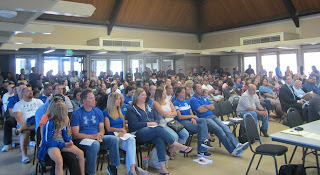 Over 200 people packed the Pavilion Building in the Elk Grove Regional Park to support changing the athletic field allocation process that has been handled by the Elk Grove Youth Sports Association (EGYSA). Of the 15 people who spoke during public comment (audio of public comment posted below), all but one urged the CCSD to strip the EGYSA of the authority of allocating field usage to the youth athletic leagues. At the core of the public's comments were that the EGYSA were giving preference to the Elk Grove Youth Soccer League (EGYSL) also known as Elk Grove FC. The EGYSA has 15 board members, three of which are from the EGYSL. Although the EGYSA handles all athletic fields, soccer was the particular focus of the discussion. Several of the comments said that EGYSL presence and influence on the EGYSA board creates a conflict of interest or a minimum of an appearance of such. Other concerns expressed included the accusation the practices of the EGYSA effectively excludes children of lower income families from having the same opportunities to premium fields that the higher-fee EGYSL participants enjoy. Elk Grove resident Anthony Ortiz (listen to his audio comments posted below) said that the EGYSA's practices are unfair and that it disproportionately affects lower income families. "Elk Grove FC is extremely expensive," Ortiz said regarding what he said was the high-cost Elk Grove FC. "'But if you can't afford it, we are going to send you to South Sac, and that's where you get to play.'" Ortiz went on to say that the practice of excluding children from premium soccer fields like those at the CCSD's Bartholomew Sports Facility who cannot afford the higher fee Elk Grove FC amounts to discrimination. Although no representative of the Elk Grove FC spoke during public comments, one board member of the EGYSA expressed his thoughts. That person was the Junior Thundering Herd football team's President, Doug Remedios, who said he did not appreciate the accusations leveled during public comment. "I've had my integrity impugned, my ethics questioned this evening, and quite frankly I don't appreciate it," Remedios said. "We do the best we can with what we got." Remedios went on to say that "there are not enough fields" in Elk Grove. During the Directors deliberations, Board President Michelle Orrock and Rich Lozano (hear audio posted below) said they were aware of the controversies, and they have been working on the matter for over 18 months. Lozano said, with the concurrence of Orrock, Directors Rod Brewer and Guy Rutter (Gil Albiani was absent) he believes Elk Grove youth leagues would be best served by having the field allocation process stripped from the EGYSA and conducted by the CCSD staff. "It appears that the field allocations isn't working," Lozano said. "That's why we are here." He asserted "we need to bring it back in and do a fair and equitable allocation of fields" and that children, regardless of their league, should not have to play on fields that outside of Elk Grove. Based on additional guidance provided during their deliberations, the directors instructed staff to develop recommendations to present at their July 20 meeting to have the field allocation process for next year performed by CCSD staff. Though not directly responding to claims made by Remedios about a shortage of facilities, Lozano also discussed whether soccer fields in Elk Grove are underutilized. "I've heard lots of complaints about that," he said. "I have driven the community, I've seen empty fields, I know what fields are off-line and when they're online, and I don't know think that anything is done maliciously, but I think it's silly that we do that." Can't get anyone to attend city budget hearings; can't get anyone to attend city meeting to grant waivers to traffic caused by projects; can't get anyone to attend hearings on how the city spent their paving money on other things; can't get anyone to attend hearings on raising tax assessments on Laguna Ridge; can't get anyone to attend hearings on 5-story hospital with helipad right in the middle of town next to homes; can't get anyone to attend hearings expanding the city limits by 8,000 acres--but by God we got over 200 people to attend a meeting on SOCCER! While you have visions of bouncing soccer balls dancing in your minds, the developers are turning our town into future slums like they did in the other suburban areas of Sacramento County. Perhaps it's because CCSD provided citizens the opportunity to relay information about their concerns and contribute to the decision-making process. Our City Council does not appear to think that the citizens of our community are valued, their opinions heard and considered in municipal decision making.